The 2017 Buick LaCrosse is an impressive car, the result of a total overhaul. Its comfort and elegance are unparalleled among its peers. It is right to call it a luxurious car, despite its relatively low price tag. The 2017 Buick LaCrosse has a decidedly classy exterior. It can sit in the capacious garages of the rich and famous without looking like a gatecrasher, and its interior will excite owners too when travelling around Oklahoma City. It is made of high-quality finishing materials that give it a sophisticated look, the kind anyone would desire and expect from a luxurious sedan. This image is complemented by its ride. It is very comfortable at high speed and firm in its footing when making its way around corners and twisties on the road. To make the drive even more satisfactory, one can choose the Dynamic Drive package that adds 20-inch wheels and an advanced suspension. The latest Buick is well positioned to battle it out with contemporary cars like the Lincoln and Lexus although it is much cheaper. It is better than or equal to its competitors in intuitive use, fuel economy, quietness, performance, and comfort. The 2017 Buick LaCrosse is available for sale near Oklahoma City and El Reno, OK.
Any family in need of a luxury car should consider the 2017 Buick LaCrosse. It gets excellent mileage of 31 miles per gallon on the highway and 21 miles per gallon in the city. Its V-6 3.6-liter engine offering 282 pound-feet of torque and 310 horsepower ensures you never get let down when you need that extra boost. The LaCrosse is the base model but it already offers good luxury and features. 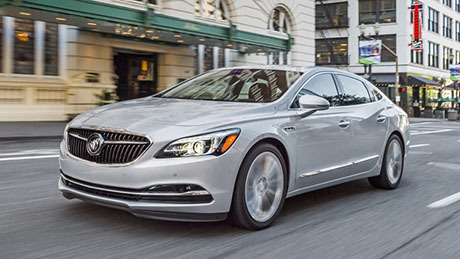 Standard on the LaCrosse are foglights, automatic xenon headlights, front power seats, proprietary Buick IntelliLink infotainment interface, and OnStar (4G LTE system and Wi-Fi), air vents in the rear, an eight-speaker sound system, and simulated leather interiors, among other features. A trunk cargo net for convenience in storage, a steering wheel that is power adjustable, and an updated satellite radio system are added with the Preferred trim option. The Essence package, on the other hand, comes with memory functions for the driver seat, mirrors that have automatic dimmers, high-quality leather upholstery, adaptive headlights, wireless smartphone charging, and seat warming for the front seats. Extra options in this package include a Driver Confidence 1 package that encompasses rear cross-traffic alerts and an advanced blind-spot monitoring system. The driver confidence system needs the Sounds and Sights package that includes navigation and a Bose sound system with 11 speakers. The Premium package comes with a rear cargo area, forward collision warning system, ambient lighting, a handy standard 120-volt outlet, and ventilated front seats with an option for massage. It also has the Driver Confidence Package 2 option that comes with an automatic forward emergency brake system with the ability to detect oncoming cars and pedestrians. The Premium and Essence trims have a number of options. The Shade and Sun package brings a power rear shade and a panoramic sunroof. The Dynamic Drive package adds suspension dampers that are adaptive to make the ride smoother, the wheels are upgraded from 18 inches to 20 inches, and the suspension design is improved for all front-wheel-drive models. The 2017 Buick LaCrosse has great performance thanks to its construction using lightweight steel. The change in material has made the car three hundred pounds lighter, so now it measures slightly below 3,600 pounds. It is now able to compare with its contemporaries in weight, whereas before it was a bit hefty for its class. A five-link rear suspension is a newly added feature that improves the ride quality and makes handling the car easy. Though it is not typical for large sedans to be comfortable and quiet, the Lacrosse delivers these qualities in spades. Exterior noise is further reduced by the lightweight acoustic and sound deadening glass. There is an option of adding wheels of 20 inches to the Premium and Essence trims. They include a front suspension setup (HiPer strut) and adaptive dampers. The 20-inch tires have reduced sidewalls. However, this is compensated by the dampers to ensure that passengers are not affected. The new struts eliminate the effects of torque steer that occurs under hard acceleration when the steering wheel pulls to the side. The design of the LaCrosse eliminates most torque steer even without the HiPer strut, but the strut certainly helps. Its V-6 3.6-liter offering 282 pound-feet of torque and 310 horsepower engine is coupled with an eight-speed automatic transmission. Most models come with front-wheel drive, but the Premium trim can come as an all-wheel drive. The 2017 Buick Lacrosse performs competitively against other large sedans on sale. It is quiet and comfortable as well as being agile and powerful. It rides well and drives well – which is not something that can be said about all vehicles in its class. It comes in a variety of trims, and all of them have a lightweight construction, outstanding performance, and precision handling - typical of Buick. The 2017 Buick LaCrosse is sleeker, lower, and 300 pounds lighter than its preceding model. Its rear is distinguished with a cute series of creases, while the grille has less chrome than the 2016 model. More exciting is that the base model comes in lower than $33,000 in price but could easily be confused with the premium trim. The reason is that they have similar LED running lights and taillights, HID headlights, and 18-inch wheels. The Preferred level comes with more color choices for an extra cost. The Premium and Essence trim levels come with alloy wheels of 20 inches. The Buick LaCrosse has a floating center console that complements the long graceful dashboard. Its interior is a combination of modernity and function and it is surprisingly spacious. It has French-stitched vinyl leather-look trim covering the doors and the dashboard. The bottom of the dash, however, is dominated by hard plastics, which are common for this segment of the market. Basic models come with an 8-inch touchscreen, nice surfaces made of faux leather, and an instrument cluster with speedometer. It has comfy front seats optionally equipped with a gentle massage feature that can be activated by pushing a button. The Buick Intellilink infotainment system is the newest technology feature in the car. It is displayed on a frameless screen that is fixed in the center of the easy-to-reach instrument panel. It has fewer controls and buttons for operations than before, making its use intuitive and easy. The car can pair with phone integration to put the features of the phone on display by employing either Apple CarPlay or Android Auto. It makes it possible for the driver to choose apps on his or her smartphone by using the touchscreen interface. The steering wheel button can be used to control many things through voice, making driving safer with hands on the wheel and eyes on the road without having to look before making a certain adjustment. The LaCrosse has 15 cubic feet of storage in the trunk for cargo, enabling you to carry any luggage you would like to. The Buick LaCrosse has better ratings in fuel economy in 2017 thanks to its more aerodynamic design, reduction in weight, a more efficient engine, and the addition of two extra gears to the transmission. The front wheel drive LaCrosse gets the following ratings in regard to gas mileage. It gets 31 mpg on the highway, 21 mpg in the city, and 25 mpg when combined. The figures are a bit lower for the all-wheel drive model. They are 29 mpg highway, 20 mpg city, and 23 mpg when combined. The figures for an all-wheel drive model are better than the Nissan Maxima and are roughly the same as the Toyota Avalon. The 2017 Buick LaCrosse is all-new and it is currently on sale near Oklahoma City, where it is sure to sell in large numbers. It has a beautiful design without sacrificing even one of its several features for safety. It has traditional standard features like daytime running lights, four-wheel ABS, and locks for child safety. Its rearview camera is improved with modern technological features that help drivers out of dangerous driving situations and to avoid accidents. It also comes with very new features like Automatic Park Assist. This automation technology helps drivers perform parallel parking by steering the vehicle automatically to the detected parking space. It also has Lane Departure Warning alerts to keep the driver safely in his or her lane. The feature works with Lane Keep Assist, which keeps the car in the center of a lane automatically. It also has alerts for lane changes, blind zones, and forward collision. These features combine to help the LaCrosse rank highly in safety. The 2017 Buick LaCrosse is for sale near Oklahoma City and Warr Acres, OK.